As with every step that is taken in the blasting process, safety is the first priority. To achieve this goal, one person, the blaster, is responsible for implementing the blast. Drilling accuracy is very important. Once the design is determined, the hole locations are marked on the ground. The drill rig is then brought in to drill the holes. The blaster communicates with the driller to find out if there were any geological conditions of concern encountered during the drilling process. Knowing the presence of such conditions, the blaster may modify the hole loading. After the hole accuracy and depth have been verified, the next step is to load the holes. First, detonators are placed in each hole. These detonators are the primary elements used to initiate the explosives in the hole. They also contain the timing sequences necessary to help maximize breakage while minimizing offsite effects. Next, the holes are loaded with the explosives that will perform the breakage. The holes are not filled completely. Space is left at the top of the hole, which will be filled with an inert material called stemming. Stemming is usually clean crushed stone or another inert material. The stemming helps ensure that the energy released by the detonation stays within the confines of the blast hole and helps focus the energy horizontally. 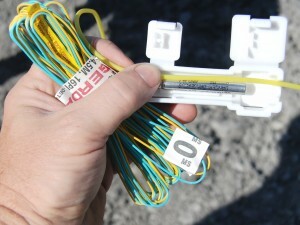 After the holes are loaded with explosives, the detonators are connected together. There are three main types of detonators: electric, non-electric and electronic. Each of these three types has its own characteristics which make it suitable for use on various blasting projects. The blaster decides which system is most appropriate. In preparation for the blast, the blaster defines the area to be secured (blast area) and will take steps to ensure that the blast area is clear. In many cases, a warning siren will be sounded a few minutes in advance of the detonation. After making a final check to ensure that the area is clear, the blast is detonated. With safety always in mind, the blaster will examine the site after the blast to ensure that it performed as planned. Once this is confirmed, an all clear signal will be given and the process of excavation will begin.